Communities in Dominica are rebuilding with the help of the UN following devastation caused by the 2017 hurricane season in the Caribbean. 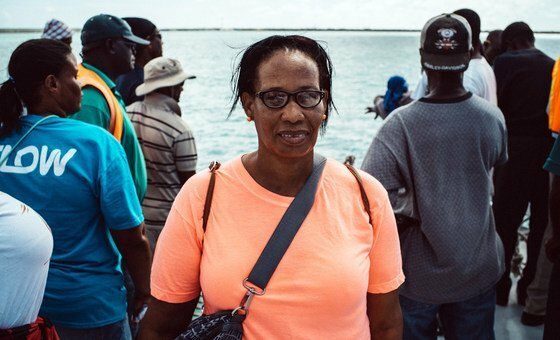 In September 2017, Primrose Thomas was at her home on Barbuda, when disaster struck: two Category 5 hurricanes, Irma and Maria, swept over the islands of the eastern Caribbean, wreaking chaos and destruction. Thousands of people in the region found themselves in the same situation as Primrose, and the UN played a major role in helping affected communities get back on their feet. In this two-part report – one year on from the hurricanes – we look at the ways in which the Organisation provides aid to those in need and, in a world increasingly affected by the effects of climate change, is finding ways to make the region better able to withstand such events in the years to come. This is how the UN Secretary-General, António Guterres, described Barbuda in the aftermath of the storms: "I have never seen anywhere else in the world a forest completely decimated without one single leaf on any tree…In every community, most of the buildings are destroyed or heavily damaged." Irma and Maria were “Category 5” hurricanes, described by the US Government’s National Hurricane Center Website, as winds reaching 157 miles per hour or higher, during which “catastrophic damage will occur”. Irma reached record-breaking sustained speeds of over 183 mph, longer than any other Atlantic hurricane on record. The most severely affected nations were the two-island State of Antigua and Barbuda, and Dominica; but many other Caribbean islands suffered damage, including Anguilla, the British Virgin Islands, The Bahamas, and Turks and Caicos Islands. Two category 5 hurricanes swept east to west across the Caribbean in September 2017. The most intense wind speeds were found in the red-highlighted zone. Haiti and St. Kitts and Nevis; St. Maarten as well as Cuba; the Dominican Republic and Puerto Rico, were also impacted. On 6 September 2017, Antigua and Barbuda was battered by Irma, the first of the two mammoth Atlantic hurricanes tearing westward along Hurricane Alley, the name for the body of warm water that stretches from the west coast of northern Africa to the east coast of Central America and the Gulf Coast of the United States. For the first time in its history, the entire population of Barbuda, some 1,600 people, was evacuated to the larger island of Antigua. Ninety per cent of homes and buildings in Barbuda were affected, 40 per cent of the roads were damaged, and the entire energy distribution network was destroyed. Dominica also saw 90 per cent of buildings destroyed by the storms, affecting over 70,000 people. In the aftermath of Irma and Maria, a UN-wide Crisis Management Unit sent waste management and debris removal experts into the affected areas, opening up roads, collecting garbage, and restoring the water and power networks. Emergency work programmes created temporary jobs and training for affected women and men, quickly injecting cash into communities. Small businesses were given grants to help them to recover: On the Turks and Caicos Islands, the large majority of MSMEs (Medium, Small and Micro Enterprises) were severely impacted by the hurricanes, and the UN supported a wide range of businesses, from pest controllers and farmers, to taxi drivers and people renting out holiday homes. Financial support also came in the form of an innovative direct cash transfer scheme, which puts money directly in the hands of affected families. Run by the Government of Dominica, the programme is supported by UNICEF and the World Food Programme and funded by the Swedish International Development Cooperation Agency. 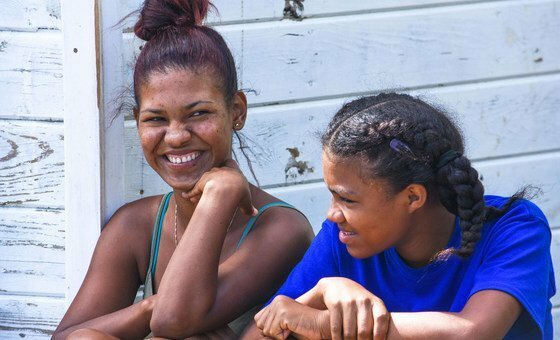 Between December and February 2017, it provided 8,000 of the most vulnerable families affected by Maria with monthly payments ranging between $90 and $239, depending on the number of children in the household. In Dominica, the priority for women farmers was to be able to get back on their feet as soon as possible. UN Women facilitated this by providing seeds, labour and equipment to bring their farms back into production as soon as possible. Eileen Lloyd, of the Bellevue Chopin Farmers Group in Dominica, is one of the beneficiaries. She described the support provided by UN Women as a blessing: “After Maria, it was very difficult to get seeds, and then we were promised some seeds and tools from UN Women and we appreciate them handing them over to us,” she said. The organisation also worked closely with the UN Population Fund to provide displaced Barbudan women and girls with sanitary items not easily found in relief packages. They distributed “dignity kits”, containing basic health and hygiene products such as soap and sanitary towels. One year on, the most vulnerable people affected – those with no income or insurance, single people and those with disabilities – risk getting lost in the system. The International Organization for Migration (IOM), has focused on helping the most at-risk communities. IOM has helped hundreds in Dominica by reconstructing their homes. Wyzell Philogene, a single mother, spent almost a month sharing a space at a friend’s house, along with around 15 others. Her roof was ripped off, and she lost nearly all her belongings. Wyzelle qualified for IOM humanitarian assistance and, a week later, a brand-new roof was erected at no cost to her. 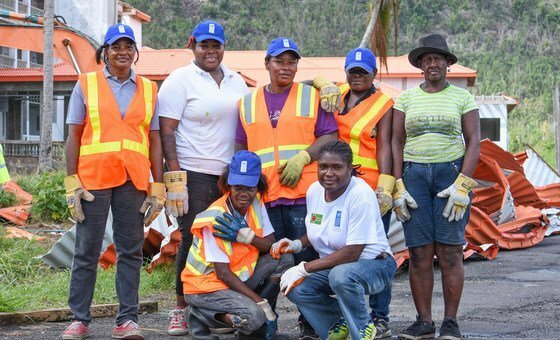 She is now able to focus on making a living, through a landscaping job made available through the National Employment Programme, and she is making sure that she is prepared for the next hurricane season. Wyzell is not alone in thinking about how to survive in the future: the UN’s longer-term planning and development teams have been working closely with emergency humanitarian workers from the very beginning of the crisis. In part 2 of this special report, we will look more closely at the efforts underway to make the region more resilient, in the face of climate change and the likelihood of more frequent, and more extreme, natural disasters.